The very act of preserving food is a way to further connect with the landscape around you and in turn, connect more deeply with the seasons. It is an action step towards food sovereignty and provides you with the ability to truly know where your food comes from and what it's made of. With a strong “Do it Yourself” mentality, Chef Frank dove into the world of food preservation to not only learn traditional techniques, but to provide his family with an array of nutrient dense foods all year long. From processing acorns to fermenting cabbage, Chef Frank knows that a well stocked pantry makes for a well fed family. Living in a northern climate with a short growing season provides a short window for fresh food, so by learning how to properly process and preserve the bounty of the summer, Chef Frank is able to enjoy an array of vibrant foods even when the ground is frozen and covered by a blanket of of snow. Frank is a Chef, Nutrition Educator, Farmer, Wild Food Enthusiast, and Family Man. Frank draws from the best, most health promoting elements within each of the diet doctrines, looks at them through the lens of sustainability, and applies them tastefully through his craft as a talented Chef. Only a few generations ago, our ancestors saw food preservation as a necessity. In tough times, women would spend their days preserving every last drop of food they could so that they could ensure their family would have plenty of food to eat throughout the winter. Frugal living didn't just mean financially, it meant using up all the parts. Preserved food can be stored without needing a refrigerator or freezer for well over a year. Not only that, but you save money when you purchase food in bulk and seasonally. Do you want to know exactly what’s in your food? Buying packaged food, canned sauces or soups, boxed broths - subject you to all kinds of preservatives, BPA, and other artificial ingredients. You can gain personal satisfaction in knowing that you’ve provided ingredients for all of your meals, all year round. My passion for food stems from the desire to live a vigorous and harmonious lifestyle, one that is closely connected to nature. In order to be on top of my game, day in and day out, I choose to eat the foods that will allow my body to excel, as well as my family's, toward greatness. The foods we choose to eat will either encourage or hinder our bodies ability to adapt to the outside world. With learning to cook wholesome meals, utilizing fresh, nutrient dense ingredients, you can begin to shift your body and mind towards balance. Cooking from scratch is one of our greatest allies when we have the desire to eat, look, and feel good. Without focusing on one particular diet, my culinary inspiration comes from a melange of dietary principles, utilizing them appropriately throughout the year.Starting with fresh, seasonal, and locally grown ingredients, I used traditional preparations to create a nutrient dense cuisine. Wondering what's on the course syllabus? The pre study will offer some insight into food preservation and lay out some important tools that will streamline your food prep throughout the year. Module 1 will lay the foundation for the course and offer charts, tips, and detailed information on what to preserve and how. Seasonal Eating charts will be offered to more directly influence your prep work and flow through the seasons. In this module, you will also learn proper techniques for simple preservation methods like freezing, drying, and even how to maximize your refrigerator. Salt has been an important ingredient for humans since around 6000 BC. This integral ingredient not only adds flavor and minerals to the food we consume, but it also has the ability to prevent foods from going “off”. Module 2 will focus on preserving food with salt and I will break it all down for you in a simple way. From creating a brine and making pickles to salt curing meat, you will learn a wide array of techniques to incorporate throughout the year. Canning food is one of the easiest ways to create a well stocked pantry and module 3 will give you the low down on this technique that has been used by home makers for several generations. First and foremost, I will breakdown high and low acid foods and what method of canning is needed. Second, I’ll share some of my favorite recipes to help you load up your pantry with dozens and dozens of delicious, seasonal recipes like salsa, chicken stock, pickles, and more. If you’re a fan of jams and jellies, module 3 will give you detailed guidance for making the tastiest fruity concoctions. Once you’ve filled your kitchen shelves with an array of preserved food, it’s time to start incorporating them into your meals. Module 4 is where Chef Frank brings his fabulous highly nutritious recipes to nourish yourself and your family. By having a well stocked pantry, you will be able to streamline your time in the kitchen and be able to more easily produce meals “on the fly”. "The astonishing fact about food preservation is that it permeated every culture at nearly every moment in time. To survive ancient man had to harness nature. In frozen climates he froze seal meat on the ice. In tropical climates he dried foods in the sun." How is this course facilitated? We have an online virtual classroom where you can access videos, assignments, and course materials. You will also be able to connect with fellow students and Chef Frank in the classroom's virtual forum, as well as in the private Facebook group where discussions will be moderated throughout the day. In addition to the virtual class room, Frank hosts a once weekly one hour live video call. If you can't make the call, no worries, we record each one and deliver it to your inbox along with your weekly assignments! All course material can be viewed (or downloaded) on your personal computer or device. “Frank is a naturally dynamic instructor who uses a multi-sensory approach to teaching. Therefore, he made it possible to acquire these skills – under his direction – through whichever learning style suited each individual best. For example, every lesson involved Frank talking about what he was doing, while doing what he was teaching, then allowing us to perform the task, and lastly (best of all) tasting what we made! Additionally, he made himself available to answer questions at all times – one of the most approachable human beings I have ever met. 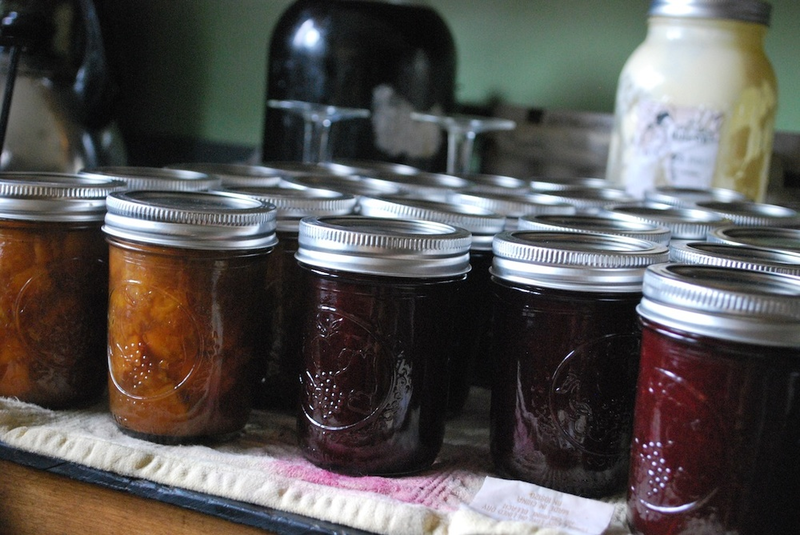 Is Chef Frank's food preservation course right for you? Frank Giglio wears many hats. At age 15, he fell in love with the fascinating world of food. Eager and intrigued, he began apprenticing directly under some of the top chefs in the US, which instilled a deep understanding of the creative process in working with food. He became a classically trained chef at the New England Culinary Institute in Montpelier, VT, Years later would go on to graduate from The Institute for Integrative Nutrition in NYC, a program would change the course of Frank’s cooking and lifestyle. While Giglio’s culinary offerings are based in classic technique and traditional foods preparation, he has also been immersed in using food as medicine. Wearing his chef’s hat, he focuses on sustainable cuisine, seeking the highest quality foods grown locally and harvested in season, supporting the crucial farm to table method of preparing food. He remains deeply connected to the earth in his daily life, merging herbalism and living food nutrition with wild food foraging. Frank creates innovative dishes that are wholesome, full of vitality and have a very small ecological footprint. He is blessed to share this passion with his clients and also with his wife and their young son. Frank and his family live off-the-grid in midcoast Maine, where enjoys spending as much time as possible outdoors, which he believes directly influences his time in the kitchen. He competes in endurance events through the mountains, prowls the woods for wild edibles, seeks out and collects spring water, seamlessly blending his love of nature with his love for food and authentic nourishment. Giglio's adventurous culinary offerings have been showcased throughout the health community as Frank is the featured chef for NY Times Best-Selling Dr. Alejandro Junger’s Clean Eats cookbook. Frank has catered weddings, special events, and weekend workshops across the country and regularly feeds guests at Daniel Vitalis and Arthur Haines primitive skills courses. Through his many ventures and projects, Frank Giglio is helping to bring the local and sustainable food movement to communities everywhere, making it extremely accessible and incredibly delicious! We're so confident that you are going to love every little piece of this Online Food Preservation Course. If you are not 100% satisfied with your purchase of Three Lily Farm's Food Preservation Course, please contact us for a full refund within 14 days of after completion of course. Refunds are only available with submission of all completed assignments and proof of participation in order to be eligible within 14 days. Questions about the course? Need help placing your order? Please contact us here. Copyright © 2012-2017 Three Lily Foods LLC. All rights reserved. Disclaimer. Sign up to be an affiliate with us here.